If you don't know what tool to use to draw a Maze, you can try Edraw. Mazes are popular games for kids. 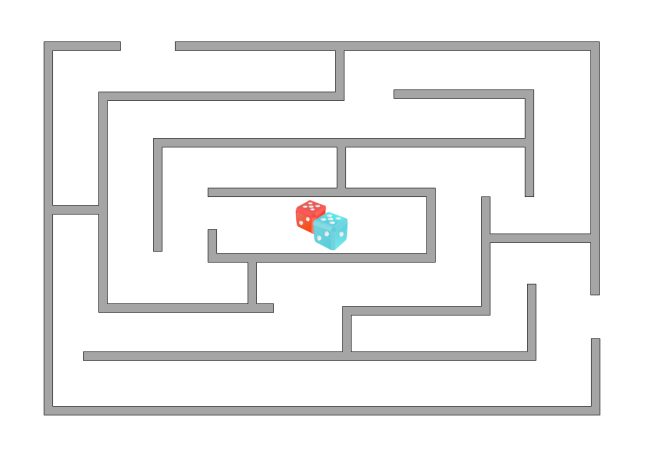 With Edraw, you can make a maze easily and quickly. Read on to learn how to make your own maze. 1. Start Edraw, point to "Floor Plans", double click the Floor Plan icon to open a new drawing page. 2. From the "Wall, Shell and Structure" library, drag and drop an exterior wall structure first. 3. Drag and drop horizontal and vertical walls inside the rectangle structure to make the correct paths. 4. You can resize the walls by dragging an endpoint. 5. Continue to add walls to make distracting paths around the correct paths to confuse your players. 6. Once done, click "Print" button to print the paper, or export the file to a desired format and share with others.